Setup automated email flows to send the right message to the right customer at the right time. Start with best practice email flows that are designed to drive sales and give you time to focus on running your store. Easily add your store's branding to your email flows. Simply, upload your store's logo and social media links during setup. These will automatically be added to all of your email templates. Or get a little more creative and customize your email layout and personalize the text. Incentivise customers to shop again with a unique coupon code. 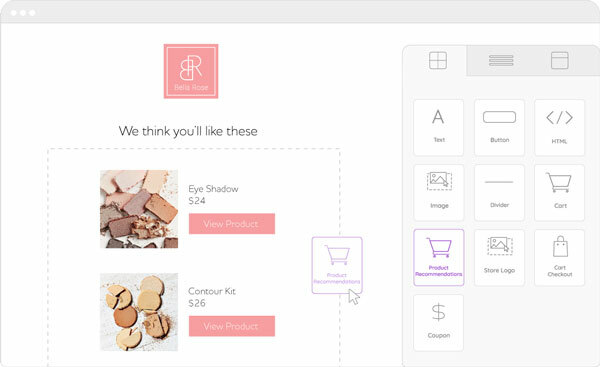 In your email template builder, drag-and-drop the coupon block into the email and customize the coupon settings – it's just like creating a loyalty reward. In the same email flow, you can choose to add the current coupon to subsequent emails to remind your customers to redeem it on their next purchase. Or you can create an entirely new coupon for the following email. There's no need to create coupon codes manually in your eCommerce platform. Coupons are automatically generated when the email sends to the customer. All coupon codes are unique and only work once. Add a product recommendations block to your email flows. Automatically pull through 3 products the customer is most likely to purchase next based on their order history. Your sender settings are used for all Marsello emails. When customers receive reward program emails and automated emails, they will see your sender name in their inbox, and if they reply to an email, it will be sent to your reply email address. Your physical store address & store url are automatically added to the bottom of every email template and are pulled from your eCommerce account settings. Abandoned cart email flow (Shopify only): First email will send 1 hour after the customer has abandoned their shopping cart. Best customer email flow: First email will start sending to customers that have spent over $1500. Birthday email flow: First email will start sending if the customer’s birthday is 7-days away. Win-back email flow: First email will start sending to customers that haven’t purchased in over 60 days. First-time customers email flow: First email will start sending to customers that have only made 1 order. Use Marsello's insights to track how the email flows are performing - the customers that have entered the email flow, the email results (sent, open, click rates) and most importantly, how many $ in additional sales made. Want to send emails outside of Marsello too? Marsello now has a MailChimp integration. Sync up to 12 customer data fields to MailChimp, including customer segment, loyalty points balance, referral program link, VIP tier, and more. 💡Tip: Remember to check your Marsello Email Flows before sending a MailChimp campaign to avoid sending multiple emails on the same subject. Have questions on automated email flows? Let our customer success team know through the chat icon on the right-hand side.